JON AUTY reviews the latest important autobiography of a man who put much of the action and excitement into the James Bond movie series. It is indeed a refreshing change to read an autobiography that actually tells you something about the subject. How many times have we seen the best-seller list filled with ‘z’ list celebrities cashing in on their 15 minutes of fame by talking nonsense for 200 pages? Here we have a man who has lived so much in the last 40 years that 340 pages doesn’t seem like enough. 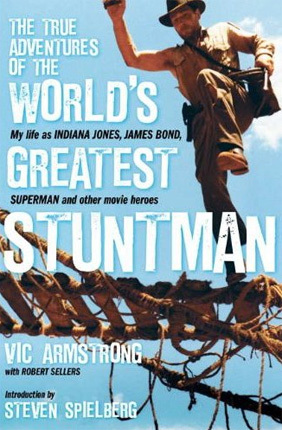 Vic Armstrong is described as the world’s greatest stuntman. This is fact. Over the last 40 years he has provided the cinematic world with many of the finest action scenes ever captured on celluloid and in most cases has started with a blank sheet of paper. The script indicates that on page 128 a fight followed by a car chase is required. Vic examines every avenue of the script and story and then goes about creating, what he believes, to be the best set piece for the film. Working with specialists, in the field of engineering, he has created equipment that is now considered industry standard. He’s also not afraid to tell it like it is. You can’t get on with everyone all the time and this book allows us into those moments where everything wasn’t all wine and roses. Stunts, friends, family and those he’s lost. It’s all here for all to share and absorb. Vic is from a horse-orientated background. His father was head farrier to the British Olympic equestrian team from 1948 to 1964. He was responsible for looking after all of their gold medal horses during this period. Becoming a National Hunt jockey was Vic’s goal and his passion but, horse riding opened avenues elsewhere. After a stint in Kenya with his family he returned home in 1956 to see his father expand the horse training side of his business by tackling other people’s horses. One such owner was actor Richard Todd. Vic would go and see Richard in Robin Hood, Rob Roy and dream of being involved in cinema. 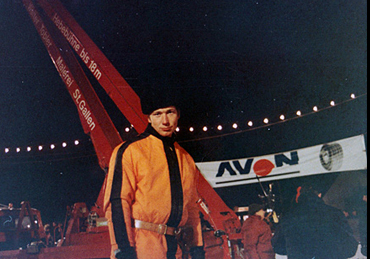 ABOVE: (left) Vic Armstrong in costume as one of Blofeld's henchmen in On Her Majesty's Secret Service  (right) With four time James Bond Pierce Brosnan on the set of Tomorrow Never Dies . As luck would have it a fortuitous break arrived courtesy of family friend Jimmy Lodge. Jimmy was simply the best riding stuntman around at that time and was working on a spy thriller called Arabesque when one of the stunt doubles, Pam de Boulay doubling Sophia Loren, had an accident on a horse whilst filming and Jimmy had phoned Vic’s dad in desperation looking for a replacement horse. He also said to Vic that he had a few more riding jobs that needed filling if he was interested. So riding on the crest of a wave and £20 a day Vic Armstrong arrived into the film business and has stayed there for over 40 years. Remember, back in the early Sixties being a stuntman wasn’t something the careers advice officer suggested when he visited the local high school. You fell into jobs in film and television back then. Many of the stuntmen at that time were boxers, doormen or villains who had done a favour for a friend and found themselves being beaten up by Honor Blackman in The Avengers or Patrick Troughton in Doctor Who. In the last 10 years in the UK the amount of stunt performers on the Equity Stunt Register has trebled and work is still difficult to find. Over 300 performers have to fight, so to speak, for roles in television drama, soaps and big screen adventures. Back in the early Sixties 25 performers did it all. This small group taught Vic all he needed to know about the film stunt business. Great names in British stunting like Joe Powell, Richard Graydon, George Leech, Rupert Evans, Paddy Ryan, Peter Brace, Gerry Crampton, Eddie Eddon and Jack Cooper. From the volcano sequence in You Only Live Twice to the children’s classic Chitty Chitty Bang Bang and onto big budget period pieces like The Charge of the Light Brigade and Alfred The Great, Vic took them all in his stride. Not turning down any work. He was averaging six movies a year doubling the lead actor here or throwing a punch there, performing horse falls and car crashes with expertise and grace. He tells of those moments that nearly ended it all. Falling from the top of a castle roof for the film The New Spartans, into a new airbag that had just arrived from the US. Over exuberantly launching himself from the roof only to realise that he was never going to hit the bag, gave it a glancing blow and bounced out, landing on his feet in the car park. Many years later on Never Say Never Again he was doubling Sean Connery diving into a well hanging underneath a helicopter. The pilot picked him up and started to fly to the location. Next thing Vic realised he was over 1000ft up sitting on a trapeze being blown about and hanging on for dear life! 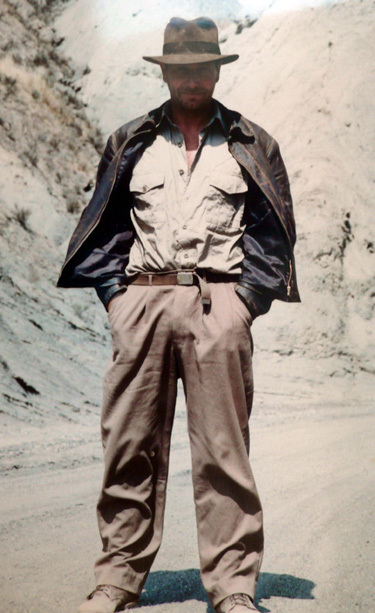 Vic Armstrong in costume as Indiana Jones. Vic doubled for Harrison Ford in Raiders of the Lost Ark (1981) and also served as double/stunt arranger on the two sequels Indiana Jones and the Temple of Doom (1984) and Indiana Jones and the Last Crusade (1989), which also starred Sean Connery as Professor Henry Jones. He also tells of the good times and the friends who have stayed with him throughout his career. His introduction to Indiana Jones is one such moment. Vic had just arrived on the set and was due to double one of the other leads in the picture. As he was walking to his trailer to get changed a voice started shouting “Harrison, hey Harrison.” Vic carried on walking and looked down to see a small boy holding his hand. He turned to see Steven Spielberg right behind him. “Oh you’re not Harrison,” he said. The child holding Vic’s hand looked up, screamed and ran off. It was Harrison Ford’s son who had mistaken Vic for his dad. This meeting with Spielberg would change everything for Vic who became Harrison’s double right there and then. Spielberg also wrote the introduction for Vic’s book. These insights into his world give the reader an extraordinary glimpse at just how tough his job must have been. Performing stunts is one thing, but then being given responsibility for coordinating the action whilst directing the 2nd unit makes the task so awesome you feel that superhuman strength would be of benefit. Vic is already familiar with this after his work doubling the late Christopher Reeve in the Superman films. Its movies like this and, of course, James Bond that have pushed the boundaries of possibility to new extremes. On the subject of Bond he has a bunch of great anecdotes about his time on You Only Live Twice, Live And Let Die, Tomorrow Never Dies, The World Is Not Enough and Die Another Day. 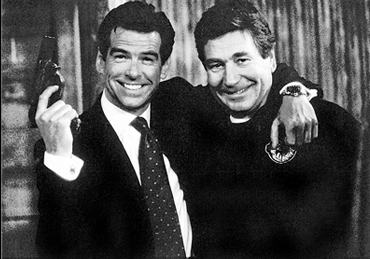 It’s worth mentioning that he also worked on the screen test fights for The Living Daylights and was very close to being the stunt-coordinator on GoldenEye, but director Martin Campbell didn’t want Vic to do both Coordinating and directing the 2nd unit, so Simon Crane stepped in. This book allows you to get to know Vic Armstrong better. He’s the sort of bloke that if you bumped into him in a pub you’d have a chat, buy each other a pint and leave good mates. My concern would be if you met Vic Armstrong in a pub all hell might break loose, windows being blown out, stuntmen falling through the roof onto the pool table ruining the intimate atmosphere. Mind you, that is the beauty of having a professional stuntman and world class 2nd unit director in a pub during a violent confrontation; at least the brawl would be well coordinated and beautifully shot.